Disclosure: FlyBy Promotions provided the Jesus Sees Us Doll and Book at no charge to facilitate our honest review. No monetary compensation has been received. Receiving the free item did in NO way influence my review. Like most families that I know, we celebrate Easter with our family and our children receive Easter baskets. We have always told our children the real reason we celebrate Easter, and have shied away from the Easter Bunny story. When I am trying to find goodies to fill the Easter baskets, it often becomes a challenge to find anything that is the least bit "religious." I have found Resurrection Eggs and some Christian stickers, but usually all you can find as a toy is an Easter bunny, duck or baby chick. 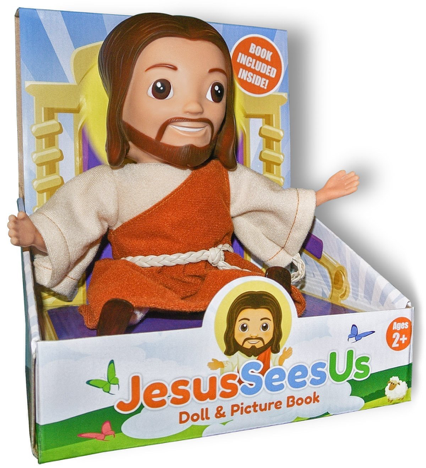 This year, I have the perfect gift for the Easter basket, the Jesus Sees Us Doll and Book! Never heard of it before? Neither had I until I was offered the opportunity to review it. My family fell in love with the wonderful book and the little ones loved having a tangible item that represents Jesus. I had never seen a Jesus doll before, and I love it! Want to know more? Here is the story behind the doll and book. 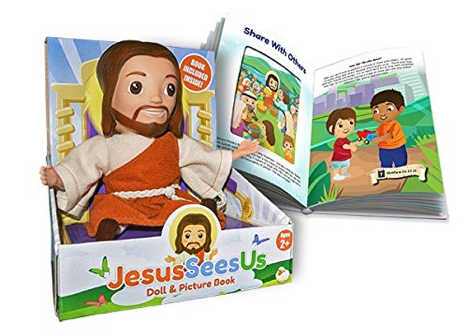 The Jesus Sees Us Doll and Book is a wonderful way to get your kids interested in learning more about Jesus. I have noticed that they will use the doll and play out some of the Bible stories. The Jesus doll is also perfect for them to sleep with. It is comforting to them to have something tangible to hold on to at night and know that Jesus is with them. Right now, the book and doll have been reduced to $24.99! You save $10.01 off the regular price at Amazon.com. Why not give your child an extra special gift this Easter? They are never too young to get to know Jesus! You can learn more about Jesus Sees Us by following on facebook or by visiting their website. I thought that was so cute but I got approved to join Flyby to late to get one.